Once in awhile a book comes along that revolutionizes your understanding of a particular subject. Such is the case with The Structure of Romans by Paul B. Fowler. Fowler’s thesis is that Romans is a letter, not a letter-essay as is commonly assumed. The difference lies in the interactive nature of the correspondence. Simply put, a letter-essay is an essay framed as a letter. While the outer material may interact with the readers circumstances (chs. 1 and 15-16), the body of the material is believed to conform to ancient rules of rhetoric which often are less interactive with the reader. The effect of such rhetoric resembles an essay more than a letter. An example of such rhetoric is the use of diatribe. Diatribe involves an author arguing with an imaginary questioner (interlocutor). The purpose is to convince or instruct the listener through argumentation. Most commentators on Romans believe that Paul used this rhetorical method. Fowler states, “Whether he [Paul] used a diatribal style at times is not at issue. He did. But to what degree does his style conform to its use in Hellenism? (p. 101). Fowler notes that, “Objections focus on opponents and create a tone of tension and argumentation, intended or not” (p. 114). He believes that Paul is using a question-and-answer method. The questions interact directly with his audience and guide the flow of the letter. Thus, Paul is not engaging an imaginary objector, but directly addressing his audience. Fowler contends, “We are caught up in the idea that. . .diatribal rhetoric. . . serves only to defend Paul’s gospel against an imaginary Jewish objector. Quite the opposite is the case. The question-and-answer in Paul, rather than answering criticisms, is providing answers; rather than confronting an imaginary interlocutor, the question-and-answer is informing and exhorting believers” (pp. 113-114). The following presents the big picture of The Structure of Romans. Fowler begins by giving 7 purposes for his book. To provide a fresh look at Romans and help those studying it to understand its nature. Pulling together arguments which demonstrate that Romans is a letter addressing major circumstances in Rome. Challenging the consensus that Romans is a letter-essay. Correcting misunderstandings about Paul’s use of the question-and-answer method employed in Romans. The understanding that Paul is using diatribe to debate objections is wrong. Such an approach leads to viewing Romans more as a theological argument rather than an interactive discourse. Paul is not debating Jews in Romans (i.e., the imaginary Jewish objector). Paul is primarily addressing circumstances in Rome. In particular, he is addressing the division between Jewish and Gentile believers. The letter’s rhetoric and grammar is essential for interpretation. It is the key to the organization of the letter. (the above purposes are found on pp. vii-ix). 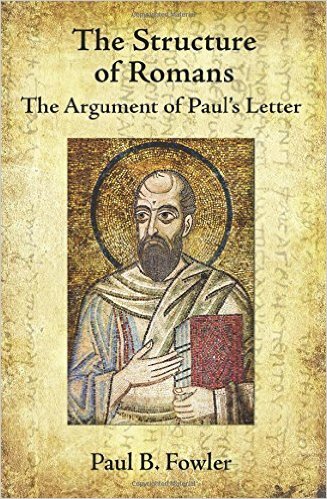 Chapter 1, Assumptions of This Study–Fowler’s thesis is: “Romans is a carefully constructed letter from Paul to the church in Rome, written to address a specific set of circumstances in Rome” (p. 1). He begins by addressing the purposes of Romans. He deals with what he considers to be false assumptions and concludes that there was a two-fold purpose for Romans: 1) To secure a mission base (for a future trip to Spain); and 2) to deal with issues involving Jews and gentiles in the Roman church. Fowler then deals with the audience of Romans. Although the letter is addressed to both Jew and gentile, its primary focus is to “bring about the obedience of faith among all the gentiles” (Rom. 1:5). Chapter 2, The Structure of Romans–This helpful chapter looks at the outlines of other major Romans commentators. Fowler points out that most of these outlines of Romans are thematic. Even those commentators who stress the importance of ancient rhetoric use the same basic thematic outline and simply plug in ancient rhetorical terms (e.g., exordium or propositio). Fowler argues that if Romans is a letter “there will of necessity be interaction with” the readers (p.29). The thematic approach fails in this regard as it approaches the body of Romans like an essay. Chapter 3, The Rhetoric of Romans–By examining various rhetorical features, Fowler demonstrates that the body of Romans is filled with more epistolary features than is normally recognized. He argues that it is important to pay attention the questions and grammar of Romans in order to determine its structure. Since Romans was primarily “heard” by its initial audience, it is the questions and grammar that guide the hearers through the letter. Chapter 4, The Surface Structure of Romans–According to Fowler’s count, there are eighty-two specific questions in Romans (p. 55). By examining the function and purpose of these questions, he presents the reader with a skeletal outline of Romans. He contends that the key set of questions which introduces the body of the letter are found in Romans 3:1-9a. He argues that these questions are not a digression, as some commentators view them, but rather set the table for the body of the letter. which ends with chapter 11. The questions in 3:1-9a are answered in reverse order forming a chiasm around chapters 3-11. I will not “spill the beans” here by giving his outline. I suggest purchasing the book for this and other details. Chapter 5, Issues to Be Resolved–This chapter deals with 3 main issues. Fowler discusses the relationship of Romans 5 with the surrounding material. Many connect Romans 5 with chapters 6-8, seeing an inclusio between Romans 5:1-11 and Romans 8. Fowler agrees with a minority of modern commentators in seeing chapter 5 as a continuation of chapters 1-4. His argument is based on linguistic and grammatical grounds. He contends that the transition to the next segment of the letter occurs in 5:19-20. Next, he tackles the issue of diatribe with which I began this post. This is followed by the closely related topic of whether Paul is debating the Jews in Romans (the imaginary interlocutor). Chapter 6, The Circumstances of Romans–Here Fowler draws together all the historical background related to Romans. His discussion is similar to that found in many commentaries. He notes the Jewish expulsion from Rome due to the dispute over “Chrestus,” as well as the socialogical factors contributing to Jew/gentile hostility. While there is nothing new here, this chapter is helpful in two ways. First, it draws together the background information into one clear and succinct chapter. Second, Fowler does an excellent job emphasizing gentile hostility toward Jews. This is important for his thesis which involves admonishing gentile Christians for their arrogance toward their Jewish brothers and sisters. Although other commentaries note this hostility, Fowler’s treatment is especially clear and enlightening. Fowler also believes that persecution (previous, present, and future) is an important ingredient in understanding the historical situation of the Roman churches. He takes Paul’s words in Romans 8:18-39 as suggestive of persecution, not simply sickness and other life difficulties. This observation also includes Romans 5:1-11 and 12:17-13:14. Chapter 7, The Coherence of Romans–In this final chapter, Fowler brings everything together and presents a complete outline of Romans. In this chapter, Fowler explains how Romans 1-2 function as the introduction to the letter. He also notes that the ending exhortations are particularly applicable to the circumstances in Rome. In other words, the exhortations in Romans 12:1-15:13 are not general, as some have suggested. In conclusion Fowler reiterates that Romans was a letter and the questions are not a diatribe to “transform” students or “answer” Jewish critics. Instead, the questions serve “to guide the narrative and to point to the issues that were driving the narrative” (p. 186). 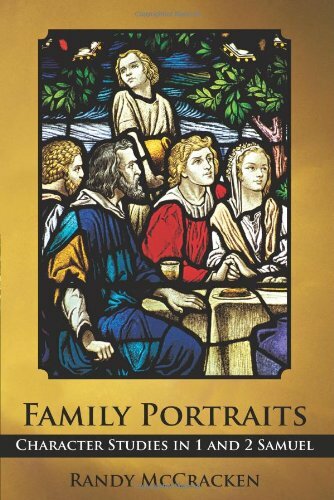 The main question of Romans is “What advantage has the Jew?” Fowler concludes by stating, “If one really wants to know the answer to that question, then read Romans!” (p. 187). Appendixes–Finally, The Structure of Romans concludes with 4 helpful appendixes. These include: “Epistolary Formulas within the Body of the Letter”; “Rhetorical Devices in Romans”; “The Question-and-Answer of Romans 3:27-31”; and “The Question-and-Answer of Romans 3:1-9”. Fowler confesses that his approach is not new and that he has relied heavily on others, especially William Campbell (p. 85). It’s somewhat comforting to know that Fowler is not coming up with a completely new way of looking at Romans. One always has to wonder about the legitimacy of an approach that no one else in 2000 years of scholarship has recognized. Nonetheless, Fowler’s view is certainly not the approach of the majority. A few features definitely divert from the norm. For example, Fowler argues that Romans 1:8-18 composes a section. Normally, 1:16-17 are set apart as the theme (or propositio) of the letter while verse 18 is seen as the beginning of the next section (1:18-32). Fowler argues convincingly, from a close inspection of the grammar, that 1:13-18 is the propositio and verse 19 begins the next section. I have already mentioned that he connects chapter 5 with chapters 1-4, which is a minority position among recent scholars. Once again, grammar guides his decision. The most significant difference of course is Fowler’s insistence that Romans 3:1-9a operates as a guide for the rest of the letter. Most would not consent to breaking up 1:18-3:20 as a major section. These are all excellent examples of how Fowler avoids the usual thematic approach. I find Fowler’s overall structure convincing. For one thing, it solves the nagging problem of 3:1-9a and trying to determine its purpose. In my teaching of Romans I have frequently noted how Paul seems to return to previous discussions. Fowler’s chiastic outline not only makes sense of this repetition, it reveals Paul’s purposeful structuring so that his hearers could follow his reasoning. The Structure of Romans is most suited for one who has spent time studying Romans. The more familiar one is with the background, themes and rhetoric of Romans, the more one will appreciate Fowler’s insights (even if you disagree!). I highly recommend The Structure of Romans and it will certainly impact my teaching of the Epistle to the Romans in the future. Thanks to Fortress Press for sending a copy of The Structure of Romans, in exchange for a fair and unbiased review. The Structure of Romans is available at Fortress Press, Amazon USA / UK, and other outlets.